But I must now amend my response. 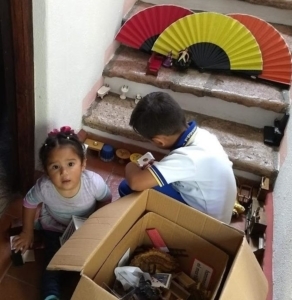 If you want to be happy in Mexico pack at least two shoe boxes full of doll house furniture. Trust me on this, or don’t, but here’s why. 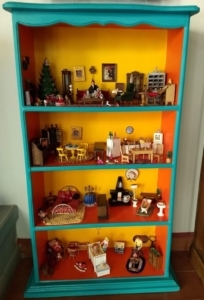 When I was child (and dinosaurs roamed the Earth) my grandmother gave me her collection of wooden doll house furniture. The tiny pieces functioned perfectly with drawers and cabinets that opened. I was a child obsessed with miniatures and had converted my parents’ entire basement into a train village complete with downtown, suburbia, and farms leading to mountains, lakes and waterfalls. So, for Nana, it was actually a very thoughtful gesture. Sidebar: One holiday season I decide this immense train village needed snow so I applied baby powder throughout. It looked great though I smelled like a baby’s clean diaper for days and it took weeks to clean up all that snow! 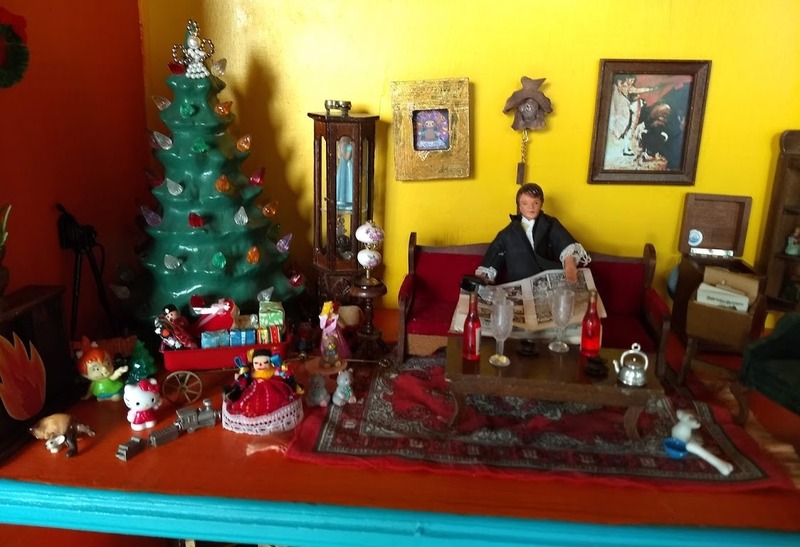 When my children were little I set aside some bookshelves for them to decorate each holiday season for the dolls’ Christmas. 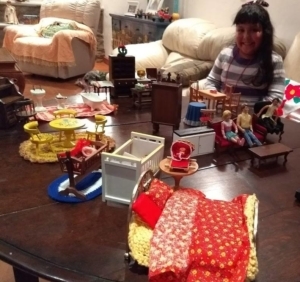 Even my daughter wasn’t too inspired as she wasn’t a big doll gal, but big gals that came for Thanksgiving would spend hours setting up the display. When I started teaching English as a second language I found the furniture invaluable as it was much easier to find the toy sofa than hold up than a real couch. Plus students liked playing with the little drawers and such. 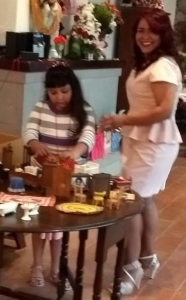 Then I gravitated towards teaching dance and the box of doll house furniture only came out at social events involving children, which, in Mexico, is every social event. Kids of either gender and most any age enjoy playing with furniture. 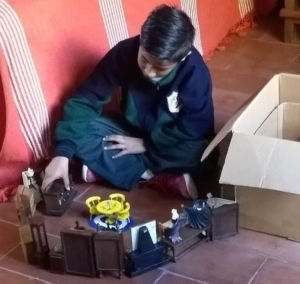 Most recently I brought the box out during my birthday party and two students were aghast at the condition of furniture. Much had been broken. I was nonplussed figuring my grown children had no interest in inheriting the collection and like with life and love, better to go out used and broken, than pristine and untouched. These students were having none of my foolish foreigner logic. So the next class they came with glue guns and set to work performing furniture repair a carpenter would be proud of. It occupied the two of them for hours and there was no dancing that night. By the end they made me promise not to make the collection available to children at a party like I had been doing. Of course, I wanted to do them one better. So I bought and painted a bookshelf so they could place their handiwork in a holiday display. 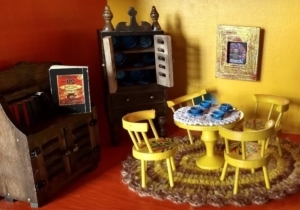 Again, another class lost to the allure of doll house furniture. Since then they come to every class with tiny wine glasses, framed pictures they painted of the Mexican Maria doll, bed sheets and even a high heel charm I placed under the bed signaling some unbridled doll lust had occurred. I told you, if you play your cards right, and use good linens, a bed (of any size) can be a blast!